Late-night, ambient-induced lounge-pop with a smoky, tingling side, the soulful temptress of Mudville's The Glory of Man is Not in Vogue is both slick and stylish, easily captivating your attention with the sultry-pop ambiance they create throughout. This is perfect music for when the party had died down, but not died, and has taken on a more low-key vibe, everyone sitting down, drinking, chatting, and relaxing. 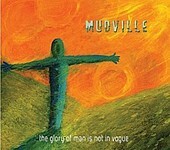 Mudville's The Glory of Man is Not Vogue creates the atmosphere you need. I'll give it a B.